I hope you all will have a wonderful, exciting (yet peaceful) and happy 2016! This year, many of my blog posts will be for the purpose of introducing new plants that I'm adding to the Garden of Aaron. Some of these plants were actually added to the garden a few months ago, but since 2016 will be their first growing season, I'll be introducing them throughout this year. My plant is to introduce one new plant each Monday morning. As the year progresses, the introductions probably will come to include some details about how the plants have performed their first year in the garden. Without further delay, here's the first introduction! 1) It's native to Tennessee and much of the Eastern U.S.
2) Gail at clay and limestone gave it an incredibly enthusiastic review, praising its ability to support butterflies, bees and birds. 3) I purchased some cut stems of blue mistflower from Laura Bigbee-Fott at a Nashville farmers market last summer and was impressed by the way that the flowers lasted up to 2 weeks in a vase. 4) It is supposed to be drought tolerant, capable of growing in full sun or partial shade, and resistant to damage from both deer and rabbits. 5) Some gardeners say it can spread too aggressively, which gave me pause. But I have a lot of open space to fill in a couple of garden beds in the backyard, so I figure I won't mind if this native wildflower naturalizes itself back there -- especially given its wildlife-friendly qualities. 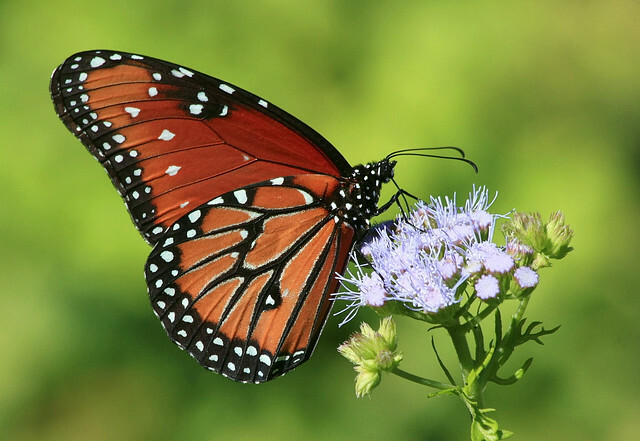 Do you grow blue mistflower? If so, what has been your experience with this plant?